The Harry S. Truman Chapter Coin is shown here with both obverse and reverse sides of the coin visible. The coin is designed using Zinc Alloy, 1 1/2 inch diameter, 3mm thickness, and having an Antique Brass finish. The obverse represents the SAR logo along with the inscription ''Fraunces Tavern - 30 April 1889, New York''. 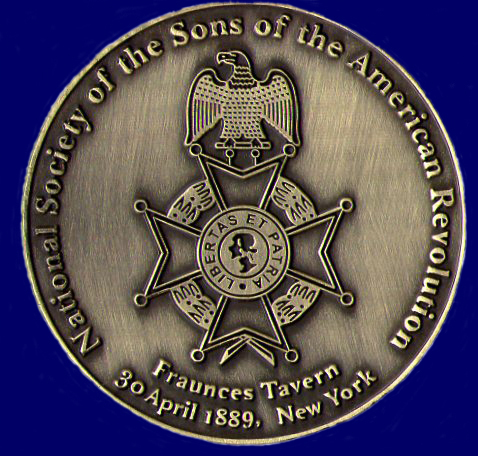 The Sons of the American Revolution (SAR) was organized at Fraunces Tavern in New York on April 30, 1889. This was the centennial for the inauguration of George Washington as the First President of the United States of America in 1789. On April 4, 1889, the Sons of the American Revolution living in the State of Missouri received an invitation to organize a State Society and send a delegate to Fraunces Tavern, in the city of New York, to aid in the establishment of a National Organization on April 30, 1889. On April 23, 1889 over fifty representatives met and organized the Missouri Society, with Hon. Josiah Fogg as its first President, and sent Hon. Gaius Paddock as a delegate to the New York Convention. Missouri was honored at that convention by the election of its delegate as National Treasurer. 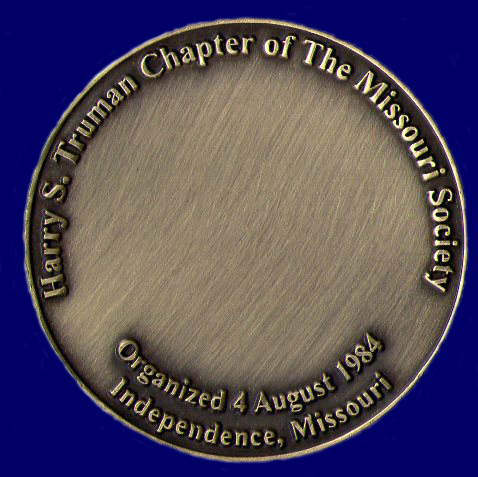 On the reverse side of the Harry S. Truman Chapter Coin, the inscription at the top reads ''Harry S. Truman Chapter of The Missouri Society'', in which our chapter was named in honor of the 33rd President of the United States, President Harry S. Truman. At the bottom of the coin, it is inscribed ''Organized 4 August 1984 - Independence, Missouri''. The coin was left blank in the center intentionally. This will allow the holder of the coin flexibility to inscribe their Name, NSSAR#, Patriot Ancestor Name(s), Year of their Patriot Ancestor Birth and Death, etc., as possible suggestions. The Harry S. Truman Chapter Coin is free to all members in good standing, meaning that their dues are current. Any member can receive their coin by attending a Harry S. Truman Chapter meeting or contacting HST Chapter President Dirk A. Stapleton. To purchase the Harry S. Truman Chapter coin, please contact Compatriot David McCann.